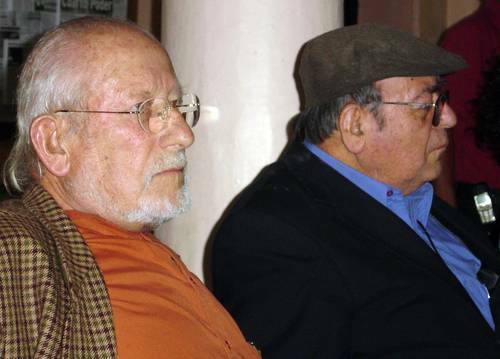 Ethno-sociologist Andrés Aubry and Bishop Samuel Ruiz García, during the presentation of a Fray Bartolomé de las Casas Human Rights Center report, in April 2006. “The Frayba is one more actor inside a liberating process,” points out Víctor Hugo López, director of the Fray Bartolomé de las Casas Human Rights Center. He makes it clear that the defense of guarantees is an action of commitment, and as much their violation as the denunciation and action in search of justice is essentially political. After a quarter of a century in non-stop activity at the state level, the Frayba’s influence and range has a national and international reach. Does that mean that “political” issues are no longer the center’s principal work? he is asked. “Everything is political,” he answers. Poverty, structural violence and bureaucratic corruption seem as political to him as counterinsurgency, induced division, electoral manipulation, judicial persecution of innocents, the executions of representatives, or the evictions. López delineates the Frayba’s functioning, which has varied in the course of years. Today, as strange as it may seem, its basic function is not defense, but rather the strengthening of the organizational processes and the work of orientation with affected individuals, involving victims in their own defense. “We did not take the lead in the Alberto Patishtán case, he made his own strategies. But we helped to make his struggle visible, we were a platform for his defenders.” He adds an astounding reality: “There are some 11,000 cases in the country of indigenous prisoners that could be similar. They have to learn to get organized and defend themselves.” He also clarifies that the Frayba “maintains the litigation of unresolved “historic cases:” the massacres of Acteal, the Northern Zone and Viejo Velasco Suárez. “To work within the context of Chiapas it is necessary to know the actors.” He mentions the number of times that in recent years alleged “comandantes” or “junta members” have presented themselves in Frayba’s offices with writings directed to the governor demanding something. “At times with seals of some good government junta, or signatures of ‘the commanders.’ Although the seals could be identical to those of a caracol, the falsification was recognizable. And the authentic Zapatistas don’t act like that.” It’s appropriate to wonder how many of these fakers arrive before governors or federal commissioners and make them believe that they were Zapatistas. Co-optation is a tradition in Chiapas. The government has pressured, besieged, threatened, courted, spied on, infiltrated and attacked the Frayba throughout the years. “To the current Secretary of Government, who different from his predecessors shows disdain, we would be organized only to ‘boycott’ the state government.” That’s how much the official mentality has advanced in the comprehension and respect of human rights. But the Frayba does not stop evolving and it deepens its prints on the communities.